If you’ve ever flown with young children, you know how quickly things can go from good to incredibly stressful. Thankfully, this mother of two young children was seated next to a daymaker. 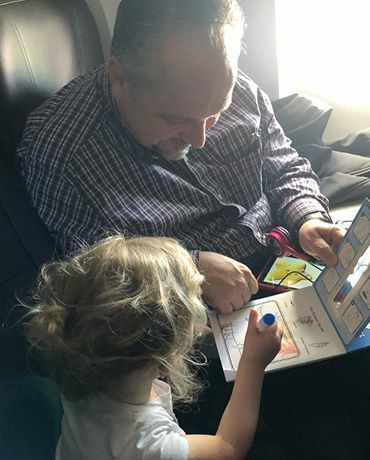 An Arkansas mom’s story of how a stranger helped her and her two young children on a flight is warming hearts across the country. According to ABC News, Jessica Rudeen, 34, of Bentonville, ran into some trouble while traveling from Missouri to North Carolina with her 4-month-old son, Alexander, and 3-year-old daughter, Caroline. Luckily, another passenger, Todd Walker, 52, was happy to help, ABC News reported. But Walker’s kindness didn’t end there. Rudeen said he also talked to Caroline during the flight and even colored and watched a movie with her. In another stroke of luck, the new friends discovered that they were connecting in Charlotte to the same flight to Wilmington. Rudeen’s Facebook post thanking Walker quickly went viral, with more than 28,000 likes and 7,000 shares. Although Rudeen did not have Walker’s last name, social media users helped her get in touch with his wife, Stacey who said helping people is in her husband’s nature. Rudeen said she hopes that the families can get together soon.